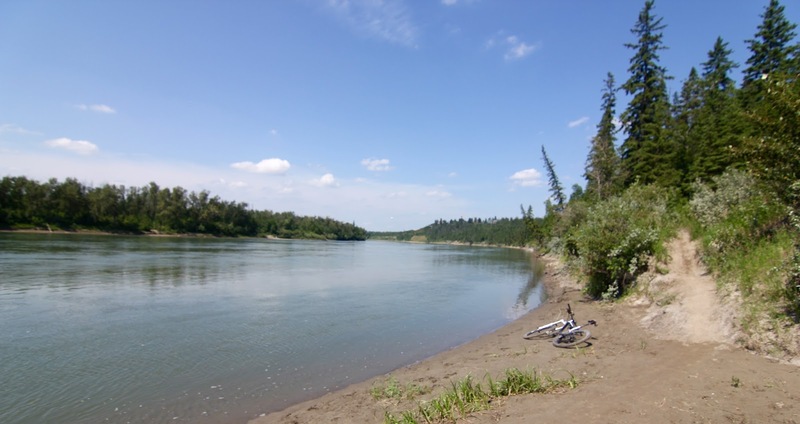 A ride from Kinseman to Terwillegar in hot and humid conditions. Now please keep in mind if you are someone in another part of the world reading this. Plus 30º with humidity may not seem much to certain parts of the world, keep in mind we are in northern/central Canada. Plus 30º does not come around too often. Mostly in the month of July where we may see it one or two times in the month. When it does happen people usually hide from the heat. Well ladies... Not this cowboy. That's right, I'm a certified badass mountain biker. I'll give you a few moments to cool down. All good? Ya, I do have that effect on the ladies. 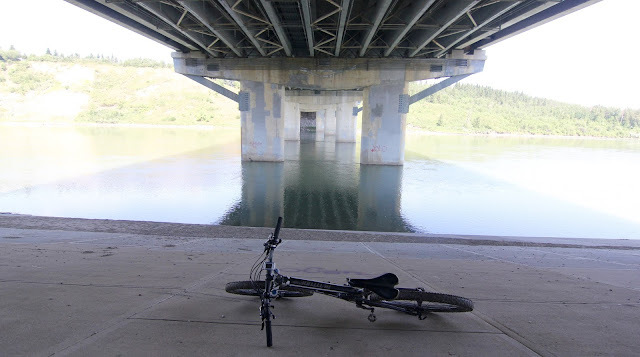 The plan was to ride the hills up and down and end up in Terwillegar. With the overbearing heat and humidity I resorted to plan B and stayed low and in the trees. A good plan. Not a very exciting ride but still infinitely better than a trip to Costco. A bit of singletrack and fair amount of multi use was ridden. Flat Pete was hit both ways on the way in and out of Terwillegar. I rode Logarithmic for the first or second time. I think me and Jason rode it a few years ago before the bridge was even started and gave it a thumbs down. The verdict today? Thumbs down yet again. The plus side is there are lots of log crossings which makes it a bit challenging but the trail doesn't have much flow. The ride ended with a lot of heat issues. A headache had started in Hawerlak where I watered down. Once close to Kinseman I was done. The heat had done me in. Right now I miss winter riding. An odd thing to say in Mid July but hey... I've had enough of the heat.